Even in the age of computers, there are many cases when mixers come in handy. The drummer needs a click track. Hardware effects need special signal routing. You want to control monitoring of some live mics, and to adjust level directly. You need to mix the sound from your computer with external hardware, and don’t want to have to mix in the computer to do it. I could go on, but you can use your imagination. 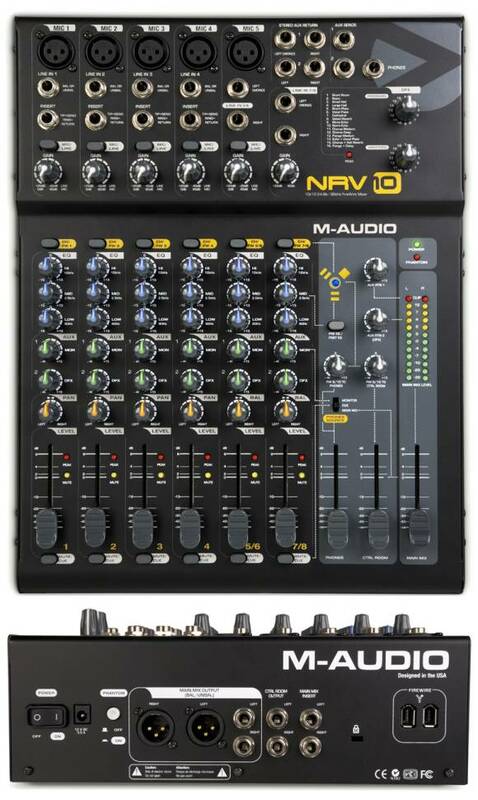 Rouding out this week’s slew of M-Audio announcements, M-Audio’s new NRV10 combines an 8 x 2 analog mixer with a 10 x 10 FireWire audio interface, at a pretty reasonable price of US$899.95 (especially if you consider having to buy this gear separately). It doubles as a mixer and audio interface, and can be used as a mixer when no computer is connected. The idea itself isn’t new. Alesis (MultiMix) and Behringer (XENYX) both have their own models, though I hope the M-Audio is better-quality gear; their experience with audio interfaces, at least, suggests it should be. Mackie’s Onyx series is well worth a look, and you can’t argue with the quality of Mackie’s mixers and interfaces. In fact, the one feature missing on the NRV10 is a 4-bus option, which could be useful for sending a separate front-of-house mix. (You could do that from the interface, but that sort of defeats the purpose.) The Mackies require add-on options for their audio interfaces, however, and lack some of the computer integration features of the NRV10. I think M-Audio was wise to make the interface standard and focus on integration. Street looks like it will be around US$700, making this a pretty good deal. My only gripe is that the only LED per channel is a single “peak” LED on each channel, which will make monitoring signal levels a little tricky, though that’s generally a problem with compact mixers. (Seriously, though; LEDs cost about 15 cents, so I wish manufacturers wouldn’t be so stingy.) Fortunately, you do have a full set of meters for the main bus. Note that M-Audio put this under a category on their website for “FireWire Audio Mixers”, meaning more may be on their way. My take is this: if you need more sophisticated mixing features, you’re probably going to go with Mackie’s Onyx line — the extra cash will be money well spent, for a great mixer with lots of features. (See the Onyx 1220, for starters.) If your needs are simpler, you want to stay on budget, and you want a more compact unit, the M-Audio looks like it has real potential. We should know more once these units start to ship this month. Having both choices means we may be really spoiled in audio interface/mixers, finally! What do you use for your mixing needs? A number of audio interfaces can double as mixers, though often minus the faders. Got a trusty 1402 VLZ sitting next to your interface? Or do you do all your mixing in-computer?